Alright I'm slowly making my way through the Macross Universe. In this post I'll quickly go over some impressions of things I played/watched in between finishing up "Do You Remember Love?" and Macross 7 (and a little bit on that at the end). Thank s to Animaster I was able to procure a copy of this 30 minute musical extravaganza. I read that it gave some info on what happened to the three main leads and that was originally why I watched it. It is true that in the last song we see brand new animation with the characters embarking into the great beyond (space not death). But there isn't a lick of dialog. The only way to really know what happened is to look it up online, or perhaps another Macross series tells us where they are going. Regardless of all that I really enjoyed the video for the music alone. I love Minmay's songs. They are cheery, but kind of eerie at the same times, and seeing moments from the movie and tv show recut to match the songs evoked the right amount of emotion. There is a lot of sadness in these songs because they all feel like they are from Minmay to Hikaru (which they are) and knowing how their relationship turns out, makes the entire thing a little bittersweet. Very powerful though. This game never came out over here in the states, but surprisingly the whole thing is in English (well "Engrish", but still). That said the story is completely incomprehensible, although the Internets tell me it takes place after "Do You Remember Love?" The game is fantastic. I'm a massive R-Type fan, and I actually think I like this game more. 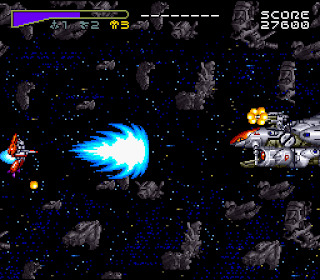 Even if it wasn't a Macross game, it is one of the most creative shooters I've ever played. Of course, this is because you can switch between all three modes of the Variable Fighter of your choice. The other cool and unique feature is that if you lay off the gunfire, Minmay's music engulfs the ship and you can use it to take over nearly any unit in the game and bring it over to your side to fight. That makes for some awesome gameplay combinations. Every shooting game fan should play this game, Macross fan or no. 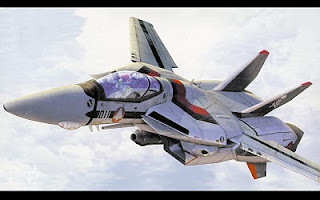 I realize that Macross Plus deserves it's own article and not wedged between blurbs about other games and side stories, but I've seen it so many times I just don't have many "new" impressions to give about it. However, I will say that having more of an understanding of the universe made it even more enjoyable to watch this time. The first time I saw it I thought it was really creative how they took a mech show and made it all about idols and human relationships. Now I realize pretty much every Macross show is about this, so it doesn't seem as original a concept anymore, but it is still a much different take on what I've seen so far. 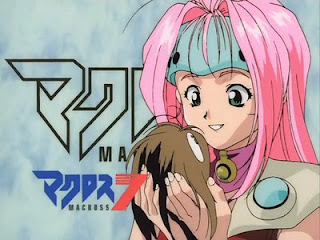 Also the final scene with Sharon Apple and the original Macross was a hell of a lot cooler now that I realized what the Macross ship had gone through before the events of Macross Plus. Can't that poor thing just rest in peace? Another excellent Macross game, though it doesn't retain much "Macross". 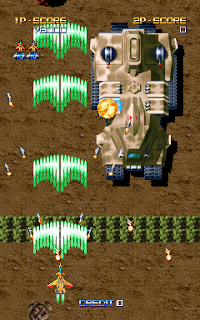 It is a top down vertical shooter. Unlike the SNES game you can't switch between your modes on the fly, you need special powerups to do that, but it is still a lot of fun. It really doesn't follow the plot of the show one iota, other then you can play as Isamu, Guld or some blue haired girl that I don't recognize. That's about where the similarities end, but it's still a fun shooter if you like those types of games. And that brings us to Macross 7. I'm not that far into it, and I'll give better impressions at a later date, but I have to say it isn't really grabbing me right off the bat. To clarify, I love all the characters so far. And I really love to see Max and Milla and their continued relationship, and their daughter Mylene is my favorite character so far. Yes I love all the characters EXCEPT the main character, Basara. He's one of the most annoying main characters I think I've seen in an anime in a long time. I think a lot of my frustration around him is due to the fact he is nearly identical to one of my best friends, who is also a narcissist, also a musician that insists on breaking out in song at inappropriate times, and even has the same comical fauxhawk. Maybe one I get over their similarities I can lets Basara's music reach my soul, or maybe he will grow upa little and I will like him more. But for now he's grating on my nerves. 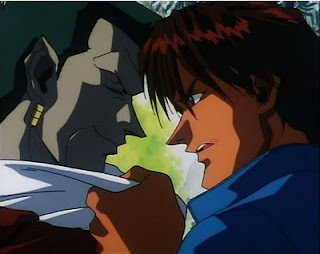 But it is a funny show, and I do laugh quite a bit at Basara's failings, and I intend to stick it out to the end.